A member of the dreaded Daluma pirate guild, this muscular female has a rare trait among pirates - a sense of personal honor. She despises Tarant Shank because of his underhanded and cruel methods and has been known to secretly work with the Galaxy Police and Airi Masaki to thwart unjust plans that Shank may be involved in, not to mention embarrassing him in front of Daluma. 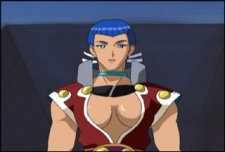 For example, Shank had kidnapped the families of Ryoko Balta's crew. The ransom - Ryoko was to kill Seina Yamada. Kyo had freed the families by secretly arranging a breakout by Seiryo Tennan. During the disturbance he caused, she had managed for the families' escape, as well as the recovery of a second-generation Jurai tree seed. From time-to-time, Kyo also found herself involved with Seiryo. When Seiryo found that a common item she had in her home was a tremendous good luck charm, she had become his second-in-command on board the Unko. They become friends over time and in the final episode, engaged.